Guest Blogger: At last I am someone! November 1973: I catch the [New York] Dolls on their now-famous Old Grey Whistle Test television appearance ... The morning after the Whistle Test, I present 50 pence at Rumbelows in Stretford Precinct and I ask for the New York Dolls single. One afternoon at the studio Tony [Visconti] shows me a film of a singer called Kristeen Young playing somewhere in New York. Everything about this singer is new. The solid fixity of her presentation is as striking as having a safe drop on your head from a tenth floor window. She belongs to no other time or fad. Even her makeup is a mystery. ... Eternally caught in life's screen door, Kristeen will discard the dress and wear the hanger. ..
[A few months later] we are in New York at the ice-cold chamber of David Letterman's television set. David always has the studio at Icelandic temperatures because he apparently sweats a great deal. Fish-eyed, we endure. The shuddering genius of Kristeen Young is with us to alarm David with her spirit-of-the-sea backing vocals, plus a few mid-ocean arm movements as we play That's how people grow up. 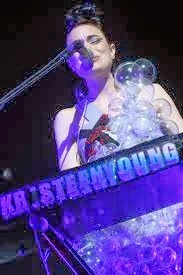 Kristeen wears her self-made 'bubble' dress that is a sirenesque bubble-wrap of Star Trek in collision with The Jetsons. Kristeen is miffed when the same creation appears on Lady Gaga two years later. observations: Morrissey seems, for our purposes, disappointingly uninterested in clothes and almost never describes what people wear unless hundreds of them are wearing Morrissey t-shirts. Although, it is true that once he makes a friend by approaching a complete stranger just because he is walking past Old Trafford cricket ground, in grim early-70s Manchester, in an elaborate glam-rock outfit. These extracts give a very good idea of what the book is like, in several senses. Many of its 400+ pages tell you little or nothing about him and much about other people - not necessarily what they'd want you to know, but hardly ever what the reader would like to know either, gossip-wise. Many of his sentences are crammed with adjectives and adverbs, in a way that can be exhausting but is often terrifically vivid. And many of the images he conjures up will bear no scrutiny as to actual meaning and yet - as long as you move on and don't think too hard - can really nail an impression. It wouldn't have taken long to remove glitches like that confusing reference to a "television set". Such things are not truly a problem but they are a distraction; but then, maybe the character of the prose would have been harmed by too much tinkering. Or by any editing at all, as most people agree it seems to have had none. I've read a load of reviews of Autobiography and almost no-one bothers to mention that it is very funny, on almost every page. Or that Morrissey's habit of making punning references to his own most famous lyrics is a bit rich, coming from someone who claims the press ignore any news about him that won't let them use his songtitles Bigmouth Strikes Again or Heaven Knows I'm Miserable Now as headlines. Or that complaining about the assumption that he's like the character who inhabits the Smiths' lyrics does not tally with this book's uncredited epigraph*: whatever is sung is the case. The whole sentence, from WH Auden, reads: 'Self-deception is impossible in opera, because music is immediate, not reflective; whatever is sung is the case." *Epigraphs are supposed to come at the beginning; but I don't know the word for an equivalent at the end, where this one comes. This extract contains pretty much all the information there is anywhere about Kristeen Young. The pictures of her in her bubble dress are not from the performance in question. 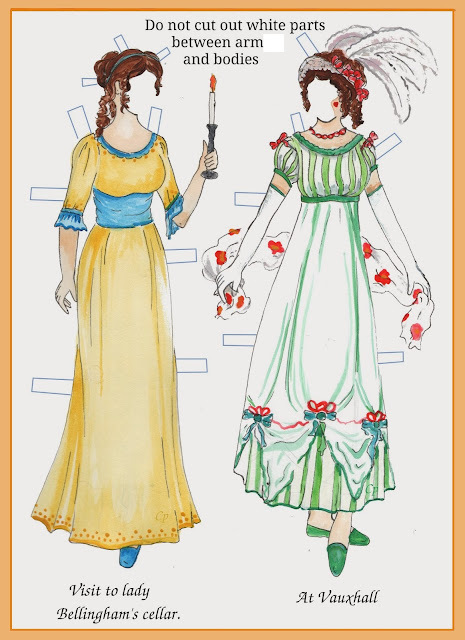 However - in what may be a first for Clothes In Books [editor's note: not a first - see this entry] - I can direct you to a video of the very incident described above. Type "Morrissey Letterman That's How People Grow Up" into YouTube and you can catch the dress and the backing vocals in all their glory. Incidentally it is said - though not in Autobiography - that when Morrissey cancelled half a dozen gigs soon after this, it was because his time in those Icelandic conditions made him ill.
You can find previous entries from this Guest Blogger here and here. He is on twitter as @colm59, and blogs as beggars can't be vegans. I was never really a fan of the music, so can feel relatively confident declining. The level of humour attracts me, but not enough to overcome relative indifference to the man himself. it soudns like K Young really did come around 10 years too early. no wonder she's angry with gaga. 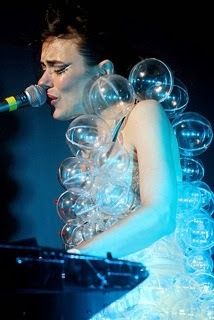 The bubble dress is a bit surprising isn't it? It wouldn't've occurred to me that someone had done it before Gaga. KrisTeen [as she spells it on Facebook, where there are plenty more fascinating photos] has a splendid duet with David Bowie, "Saviour" on her album "Breasticles". I'm not making this stuff up. She is arguably a spiritual descendant of Lene Lovich, whom I saw live a very long time before you were born, Barbara. I am not too up on any music, so a lot of this is over my head. It sounds like the kind of book I would enjoy reading if someone else had it and I could read a few pages now and then. I loved the video and the bubble dress. Colm - This actually sounds really interesting, even without a lot of clothes references. And I've always respected Morrissey's refusal to be 'cookie cutter' with his music. Somehow I'm not in the least bit surprised that t he book's witty, and what I find interesting is that there isn't a lot about him. Thanks for sharing. Morrissey is very good at describing his feelings when things happened, rather than how he views those events and people now. So I should maybe have said: it is indirectly revealing about him at various stages of his life. And of course it means he may be very kind and complimentary about someone he's going to rip to shreds a few pages down the line - always a good thing in an autobiography.